The gaming industry has a lot of yearly franchises, but none are more polarizing that Call of Duty. While there had been a few entries in the franchise before 2007’s magnificent COD4: Modern Warfare entry, no one was prepared for the juggernaut that had been unleashed. Every year, tens of millions flock to their local game store to pick up the newest installment in the franchise. But there’s no denying that, despite sales, the overall quality has diminished significantly, most likely due to over saturation and lack of innovation. Last year’s Call of Duty: Ghosts was nearly the last straw for me. While I didn’t really dislike it initially, as you can see in my review, I quickly lost interest and stopped playing it almost immediately following its completion. I swore that it would be my last entry in the franchise, and then Sledgehammer Games happened. 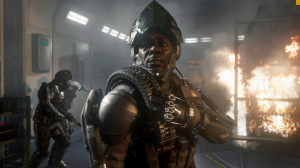 Unlike developers Infinity Ward and Treyarch, who alternate releases every year, Sledgehammer Games is new to the franchise. 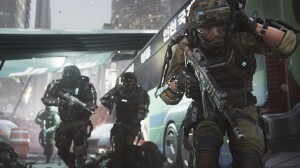 They did help out Infinity Ward with the multiplayer for Modern Warfare 3, but this is their first dive into creating their own Call of Duty game. I was skeptical, and perhaps cynical, but after seeing some game footage behind closed doors at E3 2014 (the San Francisco level footage that was later released for the public), my interest was sparked. Futuristic warfare isn’t new to the shooter genre. Most major franchises and even a lot of new IP’s have decided to forego the present for a more sci-fi laced future. Despite this, Call of Duty’s take on futuristic warfare, coupled with a compelling single player campaign, really set the tone for Advanced Warfare for me. For anyone who’s new to my reviews, I consider myself more of a single player gamer with co-op tendencies. I enjoy some multiplayer now and again, but usually I’m just terrible at it and stop playing. So when I first played Modern Warfare back in 2007, I was captivated by its gripping story and take on current conflicts. With Advanced Warfare’s campaign, Sledgehammer Games aims to tackle a conflict that may very well come to pass in the future. The story starts in 2054, as the US military attempts to intervene in a conflict in Seoul, South Korea, as they attempt to fight off a growing separatist group known as the KVA. During the battle, your character, Private Jack Mitchell – voiced by Troy Baker – watches as his best friend Will is killed. Jack also loses his arm in the conflict. As you’ll learn, Will’s father (voiced by Kevin Spacey) is Jack Irons, CEO of the PMC (private military company) known as Atlas. Irons offers you a new arm and a chance to still fight the ongoing battle against the KVA. As you join Atlas, you’re given access to futuristic weapons and technology far outside the reach of the military. Soon after, the KVA runs simultaneous strikes on nuclear power plants around the globe, leaving tens of thousands dead and leaving world governments in turmoil. With the world in turmoil, Atlas seizes this opportunity to lend aid to citizens and governments to stop further KVA attacks. World governments allow Atlas unprecedented access to their infrastructures. When Mitchell realizes that Atlas may not be exactly as it appears, he’ll have to figure out what side he’s on and what to do going forward. While there’s a certain level of ridiculousness that is inherently there due to it being a Call of Duty game, the underlying themes of growing PMC’s, dysfunctional governments, power, and American interventionism are certainly worthy topics of discussion. Kevin Spacey’s role as Atlas’ John Iron’s is perfectly cast. If you’ve never seen Spacey on Netflix’s exclusive show House of Cards, you should. As I watch Irons plot the course of the world, it’s hard not to see underlying tons of Frank Underwood. One of my biggest gripes with the Call of Duty franchise has been their apathy towards updating their graphics. While I’m by no means a graphics snob, it was frustrating to see little progress from installments five years ago. Luckily, that changed with Advanced Warfare. 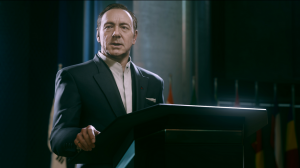 Through the use of motion capture, Spacey, Baker, and the other talented voice actors were able to bring an amazing amount of realism to their roles. While the cinematics were superior, the in-game graphics were pretty impressive too. There were some occasional grainy areas, but for the most part, the Call of Duty world seemed to pop much more than it ever has. 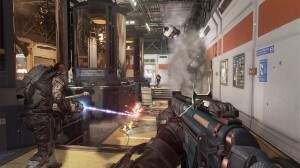 From a gameplay standpoint, we’ve seen a lot of games recently employ boost abilities and parkour style combat – most notably Titanfall and Destiny – but neither has felt as fluid as what Sledgehammer has done with Advanced Warfare. While there’s only one exo-suit, each mission has a unique load out with a ton of gadgets and abilities to help you navigate the level. Some levels you’ll have a much more maneuverable boost system, others will feature some cloaking and my personal favorite – a grappling hook, which you can use to navigate up buildings and also kill enemies. You’ve also got plenty of grenades to choose from. There are two grenade varieties in Advanced Warfare: offensive and defensive. For your defensive grenades you’ll have EMP, stun and threat grenades. EMP grenades are great for taking out drones and heavy enemies. Stun grenades are self-explanatory. Threat grenades highlight all enemies in the grenades radius for a decent amount of time, allowing you to pluck them off without much issue. For offensive grenades you’ve got smart, frag and contact. Smart grenades are thrown in the air and then seek out enemies (usually not where you’d like them to go), frags are typical and contact grenades go off when they get too close. As you hold LB (for defensive) and RB (for offensive) you’ll be given the option to press (X) to cycle between the sub-types before you release and throw it. While this is nice when you’re thinking about it, many of the times when your back is against the wall, it’s frustrating to not have a more simplistic way of setting your grenades without throwing one. These new grenade types, especially the threat grenades, are a nice new addition to the single player campaign. If you’re like me and want a decent (at worst) campaign to go along with your multiplayer experience, you should feel content with Advanced Warfare’s. My only two complaints are that we can’t customize our loadouts before each mission and how linear the campaign levels remain. 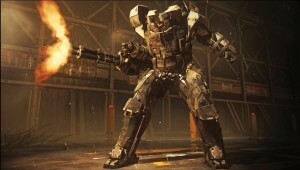 Obviously certain missions have parameters that I understand, but for the others I’d like to have the freedom to pick the guns, attachments and exo-suit attributes I’d like. Black Ops 2 allowed it and I’d like more shooters to grant you more freedom. As for a change from the linearity of the missions, it’s really needed. While a few missions gave you more freedom of how to finish various objectives, it’s still a bit too linear for my tastes. Minor gripes, but gripes nonetheless. One of the bigger surprises for me in terms of the campaign (aside from how enjoyable it was) was the addition of upgrading your ex-suit throughout the course of the campaign. As you progress through the story there will be four tiers to complete: intel collected, grenade kills, headshots and total kills. Once you reach the next level of each tier, you’ll earn a new upgrade point, which you can then put towards your exo-suit. These upgrades included (but aren’t limited to) damage reduction, increased reload speed, more health and suit battery life. While I wish there was more depth to this, I loved the addition of this and would love an expansion of it in future games to add more thought to how you play. These upgrades also carry over between playthrough’s. So, if you’re like me and start on regular and work your way up, it’s a great way to get you ready for your veteran play through. Well, there’s your single player break down. Now onto co-op and multiplayer. As far as the multiplayer goes, you pretty much know what to expect from Call of Duty. It’ll be faced paced and ridiculously addicting. Not too much has changed, but the addition of the exo-suit makes for a fun twist on the multiplayer we’re familiar with. Traversing the maps – which have added depth and scale due to the exo-suits – is now more fun than ever and with the ability to be killed from multiple levels, that constant fear of dread is more real than ever. While classics like Team Deathmatch, hardpoint and kill confirmed are back, the best new addition is anew mode called Uplink. In Uplink, A round orb is thrown onto the battlefield, and both teams have to kill each other for it. Upon grabbing it you can either throw it or pass it to a teammate, but while holding it, you’re not able to shoot. The ultimate aim is to get it into the floating enemy uplink “goal.” It’s insanely fun. To add to Black Ops 2’s pick-10 system, Sledgehammer have upped it to a pick-13 system, allowing you to customize your character with a depth you’ve never been able to. You’ll also have more freedom to customize the look of your character in game, from his face to his clothing. If you’re a fan of Call of Duty’s multiplayer (or perhaps were just disappointed by Ghosts’), you’ll like Advanced Warfare’s. As for the co-op, there’s only one mode as of now. The horde-inspired Exo-Survival mode pits you against various waves of enemies and objectives with up to four of your friend’s online, split-screen or through system link. I’ve always been a big fan of wave-style co-op. I can’t count the number of hours I spent playing horde in Gears of War and Firefight in Halo. But for some reason, the difficulty curve on this was insane, to a discouraging degree. It seemed as though the game would purposefully spawn enemies behind you, allowing you to be instantly downed at the start of a match. Even with four good players, it seemed tediously difficult and after a few matches it became more and more difficult to be placed in a match due to the low player count. Any kind of co-op is good co-op, but seriously, can we please get Spec Ops missions back? Whether you’re a seasoned Call of Duty veteran like me, a rookie or somewhere in between, there’s something for everyone with Advanced Warfare. I’m not sure if Infinity Ward and Treyarch have become too complacent with sales to continue trying to innovate the franchise, but Sledgehammer Games have managed to breathe fresh air into the franchise. There’s no denying that a three year development cycle played a large part in the quality of Advanced Warfare. My hope is that the success of Advanced Warfare (both commercially and critically) will only lead to better and more improved Call of Duty games in the future. It gives me hope that it can go back to being the genre topping shooter franchise it used to be in terms of quality and not just in terms of sales figures. Advanced Warfare isn’t without its problems, but those problems weren’t so egregious that the compelling single player story and deep multiplayer can’t overcome. If you’re on the fence about buying another Call of Duty game, this may help restore some faith in the shooter and if you’re somehow new, this should be a worthy first entry into the franchise. 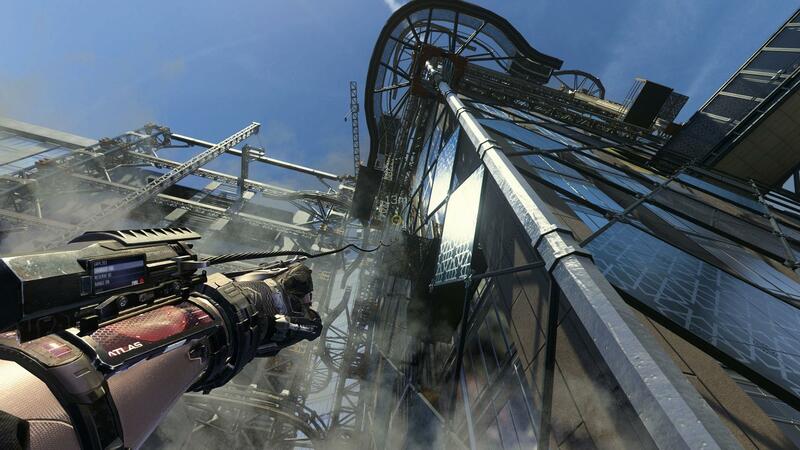 Call of Duty: Advanced Warfare is out now on Xbox One, PlayStation 4, Xbox 360, PlayStation 3 and PC. + Best single player campaign in years. 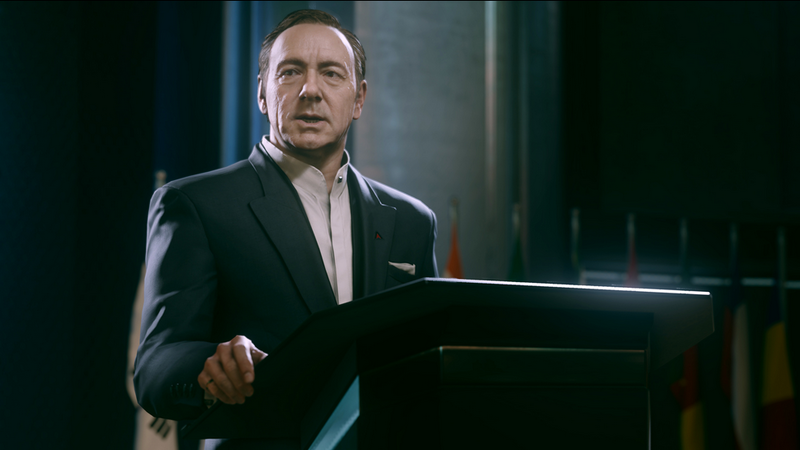 + Fantastic performances from Kevin Spacey and Troy Baker. + Exo-suits are a ton of fun to use. + Rich, deep multiplayer experience. - Awful difficulty curve makes co-op unnecessarily tedious rather than challenging. - Save issues during the campaign.